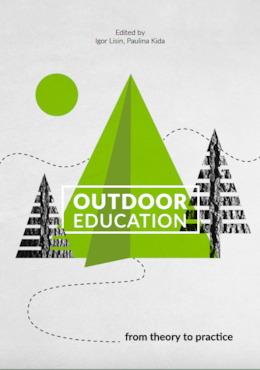 We are thrilled to present you the “Outdoor Education: from theory to practice” book, as an outcome of international team work within strategic partnership project between 5 countries in frame of European Commission Program “Erasmus+”. Our aim was to create educational materials for youth, their educators and trainers, based on Outdoor Education, contributing to the improvement of the youth work quality, as well as directly to the development of competencies and skills the trainers and educators of youth have. Our project is also a chance to promote Outdoor Education approach in wider communities and encourage educational institutions, non-governmental organizations, non-formal groups to use this methodology in their regular work with youngsters. Outdoor Education experts, youth workers and trainers from Poland, Romania, Italy, Germany and Greece, on the basis of their experience and knowledge, prepared, tested and now share with you this book. We believe it will be useful for youth work, trainer practice and educators activities, and will bring a lot of inspiration and ideas. Our Book has a specific structure to make it easier to navigate through and focus on parts that will be most often used in a daily practice.